USA Dance, Royal Palm Chapter, under the leadership of Patti MacDonald, President, will hold a 50/50 Drawing at its monthly dance at Goldcoast Ballroom on Tuesday, October 8, to benefit the National Parkinson Foundation. 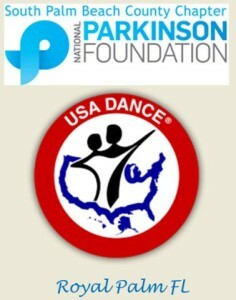 This USA Dance event will raise funds for Parkinson’s research, in conjunction with the National Parkinson Foundation’s Annual Moving Day, which will take place on November 10. The Parkinson Foundation’s Moving Day is an annual series of national fundraising events, such as “walks,” “runs,” dances, and other events involving exercise and movement. Each event “highlights ‘movement’ and exercise as a symbol of hope and progress because of its essential role in treating Parkinson’s disease,” according to the National Parkinson Foundation’s Website. 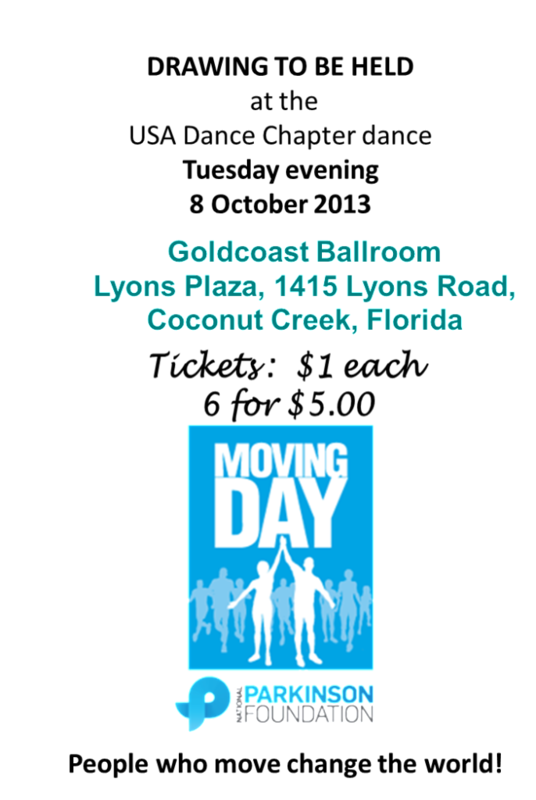 For more information about National Parkinson’s Moving Day, see the Video below. 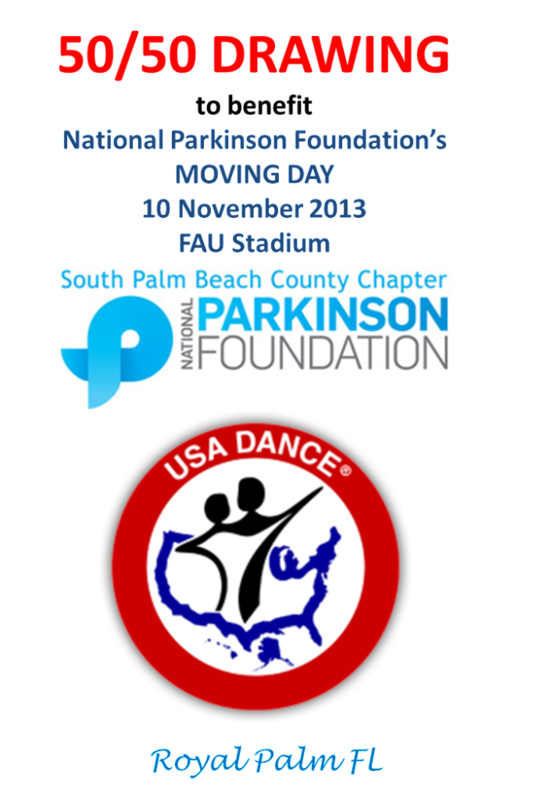 As part of Moving Day 2013, the South Palm Beach County Chapter of the National Parkinson Foundation will host a Fun Run on November 10 at FAU Stadium in Boca Raton. As mentioned, the USA Dance Royal Palm Chapter will hold a 50/50 Drawing to benefit Parkinson’s research, at its October 8 monthly dance at Goldcoast Ballroom. Tickets for the drawing can be purchased for $1.00 per ticket or $5.00 for 6 tickets. The proceeds of the ticket sales will be split, so that 50% will go to benefit the National Parkinson Foundation, in conjunction with its Moving Day, and the other 50% will go to the winner of the Drawing. « Equality Dance Classes and Practice Party Every Wednesday Night!